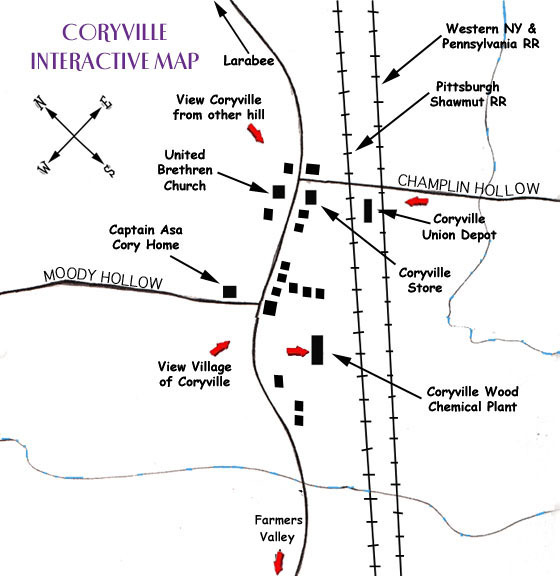 Farmers Valley, Coryville and Frisbee may be called synonymous terms. They all form a part of the old settlement of Farmers Valley, of which so much is written in the general history as well as in this chapter. In 1812 Francis King surveyed the fifty-acre tracts donated by John Keating Matthias Otto, Robert Gilbert, Jonathan Moore, Zachariah, Thomas and William Ashley. The old post-office of Farmers Valley dates back to early in the "thirties," when Timothy R. Robbins was master. Thomas Goodwin, Jackson Otto and F. C. Olds have filled the office. 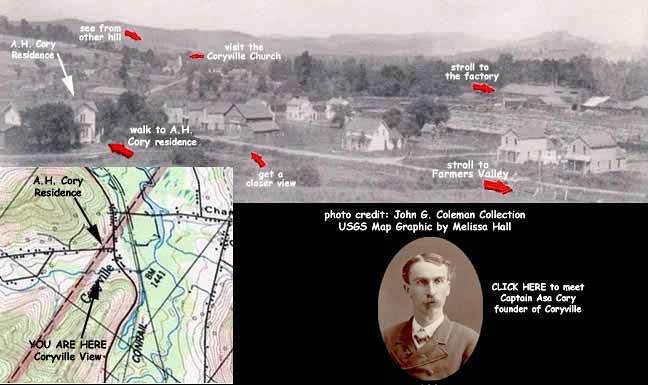 The post-office of Coryville was established in 1872 with Asa H. Cory, masters, who has been continued in office since. carpenter and builder. It has been open to all denominations, but the United Brethren may be said to be the principal worshipers. The United Brethen Church at Coryville, or Frisbee, was built in 1878-79 on land donated by A. H. Cory. The building cost over $2,000. Holmes the elder, as organizers. The E. A. U. lodge of Farmers Valley was organized in February, 1886, with A. R. Tubbs, Mrs. Otto, J. H. McQuade, Mrs. Tubbs, Mrs. Ellen Otto. J. L.
Bean, A. Tyler, F. C. Olds and Dr. R. J. Sharp, officials. June 19, 1887, a 25,000-barrel tank was burned, 1,000 teams bringing people to witness the fire. The remaining tanks were moved to Ohio in 1888.
water-power were common along the banks of this stream, and a few are found today using up the remnant of pine and hemlock of the valley and hills. Died at the home of her daughter, Mrs. B. F. Cory, Coryville, Pa., Mrs. Judith Celia Day, Friday afternoon, January 24th, shortly after three o'clock. 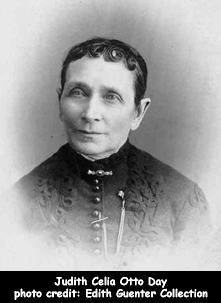 Mrs. Day had been failing in health for several months, and for about two weeks before had been confined to her bed. During this illness, she was unconscious a greater part of the time and did not realize all the suffering she passed through. The deceased was the daughter of Hon. Joseph and Mary (Brown) Otto, and was born in Farmers Valley, on what is now known as the Martin farm, February 26, 1820. She was married to Augustus Day in 1845. 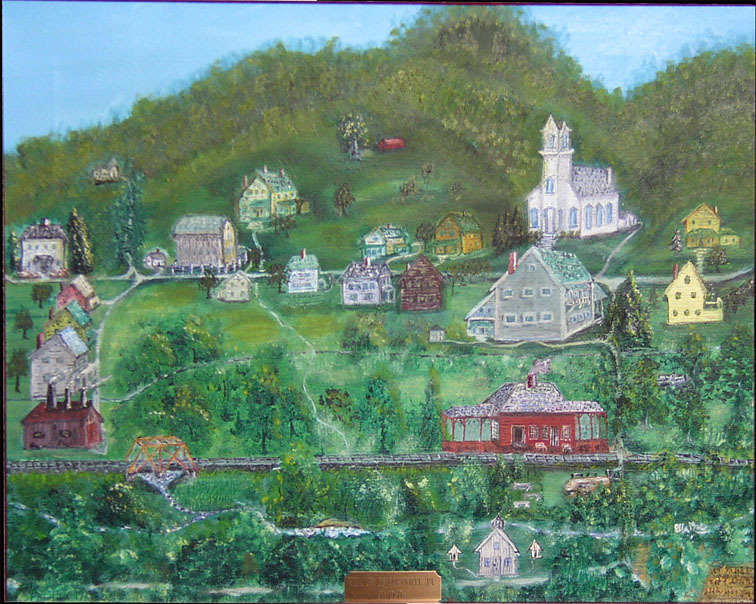 They moved to Union, Broome Co., N. Y., where they lived for several years and then returned to Farmers Valley, and moved on to a farm on Cole Creek. Afterwards purchased the farm in Farmers Valley, which Mrs. Day still owned at the time of her death, and where she had since made her home. Mr. Day died March 25, 1887. Hon. And Mrs. Joseph Otto were among the first settlers in this part of the country, having come here from Mifflin county, Pa., in 1809. Mr. Otto built the first farm house, taught the first school and held the first office in this county. He was at one time county treasurer and made several trips to Philadelphia on horseback to transact business, also held the office of Associate Judge for sixteen consecutive years. Mrs. Day is survived by two sisters, Mrs. Mary Ann Curtis and Miss Ellen Otto, also an only son, Dr. D. B. Day, Ridgway, Pa., and four daughters, Mrs. B. F. Cory, Coryville, Pa., Mrs. Frank L. Souer, Jamestwon, N. Y., Mrs. J. L. Oviatt, East Smethport, Pa., and Mrs. Jane D. Young, Smethport, Pa.. In the death of this estimable lady, the community loses one of the oldest citizens, one who will be mourned by all who knew her. She was of a sweet, lovable disposition, always ready to lend a helping hand to those in need and always doing good. The funeral services were held from the United Brethren church at Farmers Valley, of which she was a member, at 2 o'clock Sunday p.m., after a prayer at he residence of B. F. Cory in Coryville. The interment was in the Otto cemetery in Farmers Valley.